Nearly 80 per cent of the 1076 fresh fruit stores in the downtown districts of Ha Noi met food hygiene, safety and quality control standards, according to the municipal Department of Industry and Trade. RHB Bank Bhd has obtained approval from the State Securities Commission of Vietnam (Vietnam SSC) for its proposed acquisition of the remaining 51 per cent stake in Vietnam Securities Corp (VSEC) for RM21.28 million. Vietnam’s economic growth for 2018 is expected to meet the target of 6.7%, with growth in the first three quarters of 2018 reaching 6.98%, said Prime Minister Nguyen Xuan Phuc at the opening of the National Assembly on October 22. Vietnam’s rapidly growing trade and production have pushed the cargo volume through the country’s seaports to rise by 20-30 percent per annum, making port projects appealing to foreign investors. Vietnamese fruit and vegetable exporters are struggling, now that many countries are increasingly imposing quality standards. State-owned firms saw their debts rise by 1.3 percent last year to reach almost half the value of their total assets. A number of industrial and agricultural product groups have been identified as the city’s key products in the 2018 – 2020 period, giving them special priorities in terms of growth promotion. Nguyen Phu Trong, the general secretary of Vietnam’s ruling Communist Party, is expected to be chosen as the country’s next president when the one-party state’s rubber-stamp National Assembly meets on Monday, making him the first person since founding father Ho Chi Minh to hold both posts. DOES AMERICA really have the capability to influence other nations toward the ideals of democracy, free markets, rule of law and respect for human rights? Often it seems not when dictators, strongmen and party bosses engage in abominable behavior, silencing critics and imprisoning civil society activists. After a three-year hiatus, the Dung Quat Biofuel Plant has reopened and produced its first batch of E100 ethanol fuel. Vietnam is developing its own earth observation satellite to manage natural resources and mitigate the impacts of climate change and natural disasters. Eight Vietnamese fishermen have been arrested for smuggling over $72,000 worth of liquor and exotic animals, the Malaymail reported Saturday. Vietnam and Cambodia should intensify cooperation in monitoring their export and import of timber and wood products, thus minimising illegal timber trading at border areas, heard a dialogue held in Ho Chi Minh City on October 22. The southern region estimates that it will produce more than 26 million tonnes of paddy this year, up 1.1 million tonnes against last year, meeting its target for the year. A HCMC company, whose prime land is set to be repossessed by the city on suspicion of corruption, has complained to the prime minister. Giant food producer Kido Group has announced its third quarter results and those of its subsidiaries. Vietnam Prosperity Bank (VPBank)`s total asset value was reported at VND296.21 trillion (US$12.74 billion), up 17% year-on-year. Deputy Prime Minister Vuong Dinh Hue has urged leaders of HCM City to promote and arrange the equitisation of state-owned enterprises that operate in HCM City. Vietnamese shares ended on a negative note for the third session in a row on Monday as profit-taking pressure rose in the closing minutes. Vietnam’s beer market has witnessed the official arrival of premium European beer brand Amstel, the latest addition to Heineken Vietnam’s product portfolio. Coffee exporters have been told to exploit the home market as the export price is on the decrease. Vietnamese Prime Minister Nguyen Xuan Phuc delivers a report of the Government at the sixth session of Vietnam’s 14th National Assembly in Hanoi, capital of Vietnam, on Oct. 22, 2018. Applying the highest tax rate on advertisers of Facebook and Google seems to be the Vietnamese government’s latest solution to collect taxes from the technology giants, who still do not have representative offices in Vietnam and currently pass through a policy blind spot. 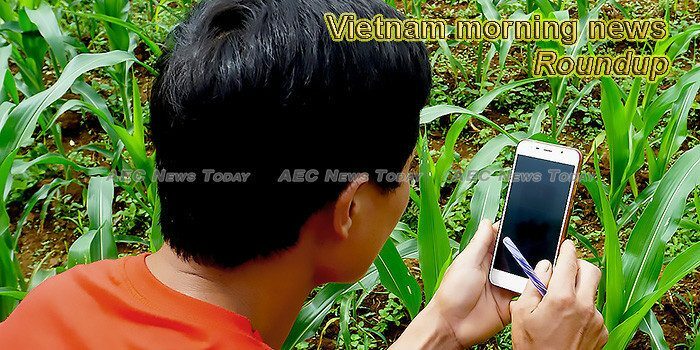 This week’s Vietnam morning news feature photo acknowledges World Development Information Day, October 24.